Professional PERFORMANCE Magazine, v. 21, I. 3 Richard Branson Edition - Articles By: Bill Bartmann, Sir Richard Branson, Marin Bright, Ambassador Nancy Brinker, Deepak Chopra, MG Augustus Collins, Berny Dohrmann, Chief Kirk Francis, Patricia Fripp, Ruben Gonzalez, Kristin Kaufman, Tim Levy, Harvey MacKay, Dr. Jeffrey Magee, Dr. John Maxwell, Dr. Ivan Misner, Tyler Ornstein, Joel Osteen, Bob Proctor, Steve Sisgold, Jim Stovall, Cheri Tree, Dr. Alan Weiss, Zig Ziglar ... 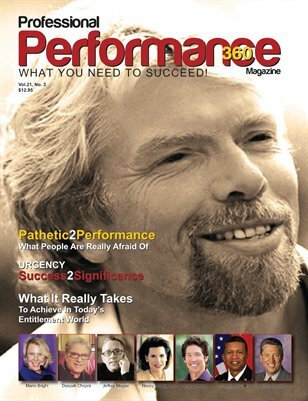 Performance Magazine is a business & entrepreneurship quarterly, featuring the brightest minds in management, leadership, sales, and performance success. Each article in the magazine has been written exclusively to you, written by business and political leaders who share their knowledge and experience to help you on your path to success.